Islamabad hopes that by seizing control of the Jamaat-ud-Dawa and Falah-e-Insaniat Foundation charities, which the US says are terrorist fronts, it can stave off being included this week on a global watchlist of country's deemed to be doing too little to curb militant financing. Rawalpindi/Muridke: The vast network of Islamist charities taken over last week by Pakistan‘s government includes a horse-breeding stable, a fleet of 4×4 trucks, a swimming academy, martial arts classes and tens of thousands of staff and volunteers. Islamabad hopes that by seizing control of the Jamaat-ud-Dawa (JuD) and Falah-e-Insaniat Foundation (FIF) charities, which the US says are terrorist fronts, it can stave off being included this week on a global watchlist of country’s deemed to be doing too little to curb militant financing. But the sheer scale and diversity of the charities founded by Hafiz Saeed, who is designated a terrorist by the UN, shows how difficult it will be for the government to even run the network, let alone track and take control of all their sources of income and funding. Reuters visited three of JuD’s main facilities – protected by close-circuit TV cameras, huge iron gates and stout-built, bearded guards – including a sprawling 200-acre headquarters in Muridke just outside the eastern city of Lahore. A few government representatives were on site and new signs hung to rename the facilities, but little else appeared to have changed since the government announced it was banning the charities on February 14. Officials said they have not yet drawn up plans on how to run the network, which includes more than 300 seminaries, schools, hospitals, a publishing house and ambulance services. Hafiz Saeed is one of the founders of the militant group Lashkar-e-Tayyaba (LeT), or Army of the Pure, which Washington and India blame for the 2008 Mumbai attacks that killed 166 people. The US has offered a $10 million reward for evidence leading to his conviction. The LeT has been banned in Pakistan since 2002 but Saeed, who denies involvement in violence or funding militants, was freed by a Pakistani court from house arrest last year and his charity wings had been allowed to remain in operation. Those charities are the focus of a motion co-sponsored by the US and European allies calling for Pakistan to be placed on the terrorist financing watchlist maintained by the Financial Action Task Force (FATF). Member states of the FATF, an intergovernmental body that sets global standards for fighting illicit finance, were discussing the motion at a meeting in Paris this week. The move is part of a broader US strategy to pressure Pakistan to cut its alleged links to Islamist militants. Pakistan was on the FATF “grey list” from 2012 to 2015. Islamabad has recently been scrambling to avert being put back on the list, a measure officials fear could hurt its economy, by taking a series of measures such as amending an anti-terrorism law and banning JuD and FIF. Saeed denounced the latter move in a fiery sermon on Friday, accusing Islamabad of caving in to US and Indian pressure. “It is regrettable that rulers have been bowing to external powers” he said, adding that Islamabad was making the nuclear armed nation an “American colony”. At JuD’s Muridke headquarters, Reuters found the day-to-day management of the charity running largely as before. 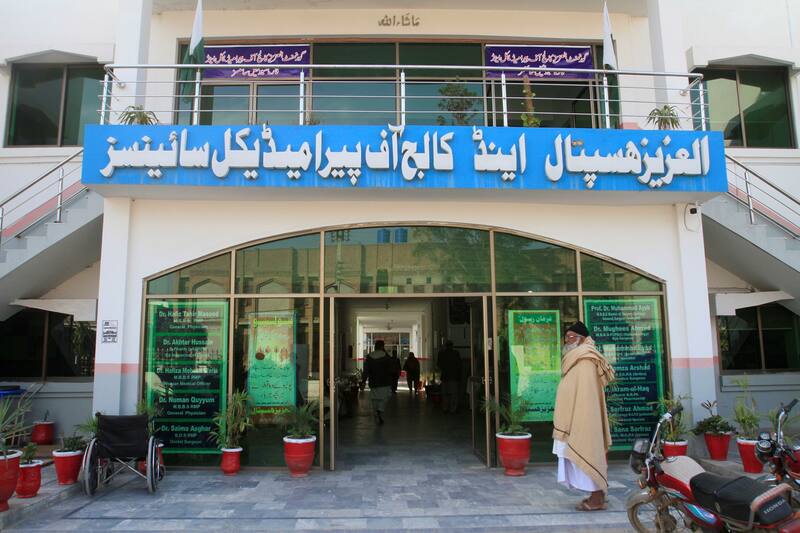 Only an administrator, two school principals and a doctor had been added by the government to the facility – previously known as Markaz-e-Taiba, now renamed Government Health and Education Complex Sheikhupura – where nearly 1,000 students take classes, a JuD official, Mohammad Athar, told Reuters. Besides some 500 visitors daily, Athar said, nearly 3,000 students and employees live on the site, which boasts manicured lawns, rice fields, sports grounds, hostels, residential colonies, a swimming pool and a horse stud farm. “Schoolboys swim in the pool during summer season,” Athar said. “There are 35 horses for their riding classes.” The students play soccer, gymnastics and martial arts, he said. Cricket is prohibited, said Athar, who believes the game is “a waste of time”. At JuD’s Hudabya Madrassa in Chakra, on the outskirts of Rawalpindi, which caters for nearly 160 students, 22 teachers and a dozen more of staff, just a caretaker had been appointed since the government takeover. “I’m drawing 20,000 rupees ($200) salary a month,” said a teacher, Tariq Husain. Monthly expenses for the facility could amount to 1-1.5 million rupees ($10,000-$15,000) a month, according to Reuters’ estimate, based on the salaries staff reported and likely overheads of a facility that size. “People come and donate,” said another teacher, Mohammad Musab. “Our group mainly bear the expenses,” he added, while handing out sweet milk tea and cookies to Reuters journalists. He said a government official came and took office records on Thursday. At a third facility, in the heart of Rawalpindi, a grand mosque was under construction, adorned with banners appealing for donations for the Muslims in Kashmir, Palestine and Syria. Pakistan has long denied accusations from Washington, New Delhi and others that it supports Islamist militants operating in Afghanistan and disputed Kashmir. Arif Jamal, the author of Call For Transitional Jihad: Lashkar-e-Tayyaba 1985-2014, said patience had run out with Pakistan‘s “double game”, and doubted the takeover of JuD and FIF would succeed in heading off further action. “My sense is that they’re not likely to believe Pakistan for a long time even if Pakistan starts to take serious steps to dismantle terrorist parties,” Jamal wrote from Washington in a WhatsApp reply to Reuters. But Pakistan‘s former counterterrorism chief, Khawaja Khalid Farooq, said there were insufficient grounds for the country to be put back on the FATF watchlist. Pakistan‘s foreign office spokesman Mohammad Faisal told local 92 TV that Islamabad was lobbying to block the FATF motion, which he called US “pressure tactics”.